Warriors, or a motley crew heading to a Halloween party? Fire Emblem Warriors is already out in Japan and is just a week away in North America / PAL territories. Of course, the Musou series is big business in Japan and we only get some of the games in the West; case in point, here are three Musou games heading to the Switch in Japan on 9th November. They are Dynasty Warriors 8: Empires, Samurai Warriors: Spirit of Sanada and Warriors Orochi 3 Ultimate. All are ports of older games, some on current-gen hardware and others that are distinctly 'last gen'. Have a gawk at a summary trailer below. Unfortunately these releases will only have Japanese language support, so if you opt to download them from a Japanese account you should bear that in mind. The outfits, though... it might be worth it for those alone. I've always wanted to slaughter thousands of brain dead grunts in my best tennis kit. 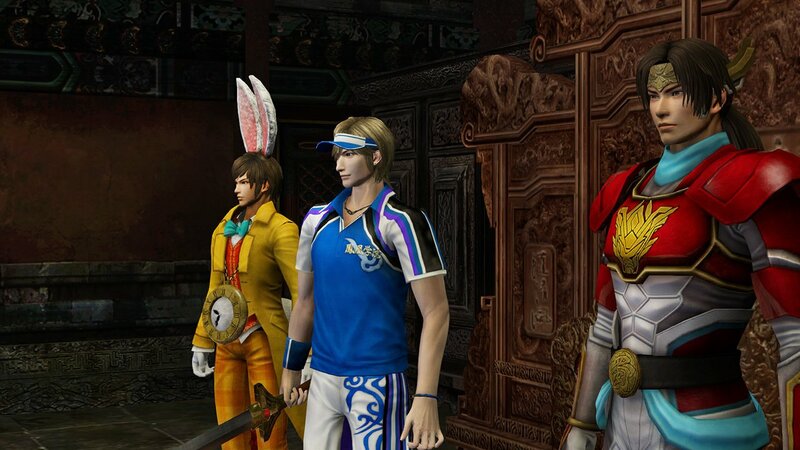 So Dynasty Warrior is set in Ancient China, Samurai Warriors in Japan, what about Warriors Orochi? Also sound Japanese. I've only ever played the Gundam Dynasty Warriors and Hyrule Warriors games so more into the content than the gameplay. They are cathartic though. Are all three releasing on the same day? That seems counter productive. @MegaAdam they did the same thing with those two horse jockey games. I'm starting to think they have a special deal with Nintendo. I've never played a Warriors game. I always meant to pick up Hyrule Warriors but never got round to it. That would have been a perfect place to start. FE Warriors looks even better than HW but I have no real attachment to the FE series or it's characters. If any of these 3 make it to the west at a decent price I'll likely buy it. Meh, never cared for these type of games. Never got them for the VITA, not getting them for the Switch. I haven't played Spirit of Sanada yet, so I'll get that if it releases here. I might also get DW8E (again) just for endless musou-ing on the go. I already own WO3U twice so I won't be getting that again. That game is huge enough without me having to play it three times! @MegaAdam Meh, I'm guessing they're hoping to tempt people who enjoyed FEW/HW but never played a normal Warriors game. 3 might be a little much, but still people have choices. @Angelic_Lapras_King if this was an American release I would agree but the Japanese love musou games. DW8E is kind of a sandbox version of DW8. 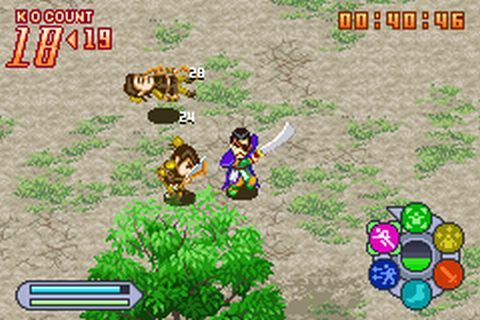 You pick/create a character and scenario and fight battles to change the fate of the land. If you are looking for story, look elsewhere. SWSoS is a tie-in to SW4 where you follow the entire life of Yukimura Sanada, his family and all the people involved with them. WO3U is a crossover between DW, SW and also has a few characters from other Tecmo Koei franchises (Ninja Gaiden, DOA, even Soul Calibur) and has a crazy story about historical characters time travelling and defeating demon armies. Please don't release in English...I don't want to lose ALL of my free time. (but actually do though because I'd rather read a language I understand) DW8E is a for sure from me, SOS is very likely, but I don't know about WO3 it looks kinda weird to me. Amongst those 3, Orochi is the one that is more "fantasy" oriented right (fantasy is in more in the Japanese folklore, and not as much on the historical side of things)? Because ever since Hyrule Warriors, I kinda grew tired of the standard Dynasty or Samurai Warriors. I want...a little more. I also hope they port All-Stars on Switch! I've been playing Dynasty Warriors 8 Xtreme Legends over the last month or so, and as far as introductions to the Musou subgenre, it's pretty great. The roster is large and varied, and the characters are interesting, and the setting is really interesting - despite me having no prior knowledge of the source material - the Romance of the Three Kingdoms Epic. I'm a bit underwhelmed by the new Fire Emblem Warriors game, even though I've preordered it, because, while I'm more familiar with the Fire Emblem universe, it would have been nice to have as large a roster (Orochi has 145, according to that trailer) - as many unique weapons - cameos of lesser fire emblem characters as officers (although Dynasty Warriors has hundreds of these, they're generic characters with mix-and-match headwear/voices/heads, so this wouldn't really work for Fire Emblem Warriors). But then again, Fire Emblem Warriors brings some new mechanics to the table, so I'm hopeful it'll be fun in its own way. Ooooh nice! Getting them all, love the hack and slashhh. Just destroy them all. the switch is getting alot of games, cant even keep it up anymore lol. @faint Those two horse jockey games made sense though. They allowed transfers of characters and other data between them, and one was a racing simulator and one was a sports managements simulator. This case though? I can't find any logical reason lol. Since I really liked Hyrule Legends I might pick up Fire Emblem warriors down the line when it's been out for a bit and hopefully gets a price drop. Orochi sounds interesting if we get these in english, sounds like you'd be able to see a little bit of both series characters and some other fun ones in a crazy story. Played WO3U on PS4. Played DW8E on PS3. Even bought DLC. Sold the games because I got bored with them after clearing them out. So Switch is finally getting them? Boring. Nothing to see here. Move along. Oh yes, PS4's getting DW9 soon. Oh, and we also have Warriors All Stars. So there's that. Seriously guys, stop wasting time and money here. You deserve a real gaming system, so until Nintendo decides to LISTEN to their fans and make one, go PS4 or XB One, or heck, PC's got good games. Don't support Nintendo's dripfeed. You all deserve better. and Warriors Orochi 2 Ultimate - not 3. @SKTTR I think they have regional title differences. Might have to google it. I don't particularly enjoy the Musou games, but I had a blast mowing down fleets as Fierce Deity Link in Hyrule Warriors. Still hoping that gets ported over. @edhe Guess I did sound like that a bit. But it's true. Switch is getting old games that aren't worth playing anymore. If you'd gotten a PS3 or PS4, you wouldn't have had to wait this long to play them. And what did you gain by getting a switch? 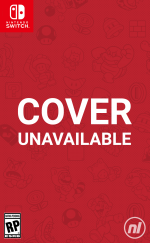 Mario Odyssey , and upgraded versions of Splatoon and Mario Kart 8. That's it. You'd have been better off sticking with your Wii U.
I'm not saying Nintendo ONLY makes bad things. The 3DS is certainly worthwhile. better than the Vita, no question. I'm not a Sony, Microsoft or PC fanboy trying to tell you your console is bad. I'm a gamer trying to tell you your console is bad. Better to jump ship than to sink with it. Look at NBA 2K18. A horrid greed fest of a game, that's only made worse by being released on the Switch. You seriously think that's worth championing? N fans: "Alright! We're getting Dynasty Warriors 8 Empires!" Other fans: "Already had it." N fans: "So what? We've got Zelda and Mario!" Other fans: "I've got games like Zelda too. And I've got other platformers to replace Mario." N fans: "They're not as good though!" Other fans: "Why? Because they're not Zelda and Mario?" ^ Well that's just stupid. I buy just about every game system that gets released unless it's complete trash and the Switch is quickly becoming my favourite one of the current and past gen systems combined. I'll be getting all 3 of them and have Fire Emblem Warriors preordered. We're not getting the Dragon Quest ones over here are we? One I really want to see is Samurai Warriors 4 and Gundam 3. @meppi SW4 was kind of fun, but SW4 II was better overall. And DWGundam 3 is old. DWGundam Reborn is newer and much better. Oh, and you're not missing much with the Dragon Quest games. I beat the first one, and it was meh. I tried to like the second one, but despite it's improvements, it failed to impress me. But my opinion, is that Switch have many games that I like, more that PS4, One, PC and mobile (android) ones; and tells you someone who wants to buy a Vita and PS4, because there great games too, then. Don't tell me that I don't buy, Thanks!! @SKTTR Due to convoluted localization hijinks, Japanese numbering on DW and WO are one number behind western version. So the upcoming DW9 is actually Shin Sangoku Musou 8 in Japan. @CheddarSword "That's it"...for now. I mean, come on, Switch isn't even a year old already. For a long while in its early years even PS4 was mocked because its only worthy exclusive was just Bloodborne with other titles being either multiplatform or remasters. It's common thing in console early years. Wow, cool posts. Regarding your first post, where you mention Nintendo listening to their fans(or lack thereof), assuming Sony and Microsoft do? Lol okay. Its funny you say that because FE Warriors was something fans were asking for ever since Hyrule Warriors. Seems like they're listening to their fans... Switch is getting old games? I didn't know BotW, Bomber man, Arms, Splatoon 2, Mario+Rabbids, FE Warriors and Mario Odyssey were all old games! @SakuraHaruka 2 things. 1: grammar. learn it. 2: Your opinion is not better than mine. It's simply your opinion. My opinion is also not better than yours. @raisenv that is indeed a fair point. But counterpoint: There's not much on the horizon that is exclusive to the switch that looks very good. Metroid Prime 4 and we haven't even seen any gameplay. @KryptoKrunch No, microsoft and sony don't listen to their fans. But they do deliver a console that they enjoy. As for FE Warriors, fair enough, they listened to their fans. But I do recall Star Fox Zero's devs ignoring people's pleas for better controls, only to have the game fail at launch. and instead of giving metroid fans a new 2D metroid game, they instead gave them a remake of one of the least liked games in the franchise. Sure, people are liking it, but it's still not a "new" game. And your last point, Splatoon 2 is basically Splatoon 1 with a few extra bells and whistles. the story is basically the same as well. At least from what i've heard. As for BotW, it's also available on Wii U. so it's not exclusive to the switch. As for Bomber man, how many times can you re-release the same game with a new coat of paint? bomber man is bomber man. The only real exceptions were the N64 and Bomber man and Max games, and the latter was stretching it a bit. So that leaves Arms, Mario+Rabbids, FE Warriors and Mario Odyssey. 4 truly new, exclusive games. Heck, i'll even give you Prime 4 and Xenoblade 2. 6 new exclusive games. All while every port the console receives suffers from lower frame rates and lower quality graphics. Not to mention the fact that many of them are games that other consoles had long before now. And yet on PS4, people are enjoying games like Horizon Zero Dawn, Persona 5, Uncharted 4, Gundam Versus, The Last Guardian, Final Fantasy 15 and will soon be enjoying Blazblue Cross Tag Battle. And this is only a few of the console exclusives. And please note that i have shown no bias towards any of the games mentioned. I'm sure Splatoon 2 is a good game. And maybe it is indeed different enough from Splatoon 1 to call it a new game. But even added to your total, (would be 7) I have listed just as many PS4 exclusives, and can list more. You however, can't. Because you've exhausted your list. And I even added to it for you. And then there's PC. Not to mention multi console games that just aren't on switch at all. Street Fighter 5 and Nier Automata to name two. And they're all good, enjoyable games. Games that you, as a switch owner, are missing out on. are the games you listed that good? be honest with yourself. If you can honestly say "yes, i'd gladly take these games over the ones you've listed and the exclusives you haven't." and not have any hesitation, then there's nothing more for me to say. Sorry, but, I speak spanish, I have difficult for write in English, and also, don't use this as a pretext!, ok? 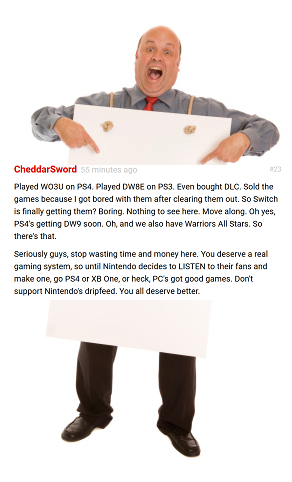 Second; Exactly, an opinion is not better or worse, however, with that you mention that we stop supporting Nintendo and Switch, just because you want (and of course, giving your points of view), you imply that you IMPOSE your opinion to ours, and that is something that you must understand; one thing that gives your opinion and another that tries to impose ideas, is clear? @CheddarSword Your argument/complaint against a system in this infancy makes no sense, especially when you said before that 3DS is good system, but surely you remember how it was struggling in its early days leading to price cut (I bet you'd say "stick with your DS" at that point). Switch early days now are more promising than 3DS or even Wii U. And it's not like Nintendo will never ever release any other games other than what's shown this year. Also you wrote that wall of text to reply to KryptoKrunch while completely ignoring one simple fact: people can and do own multiple systems. Not everyone here is rabid Nintendo fan who swore to never buy system from other company. You said Switch owners are missing out as if everyone here only owned Switch and nothing else. If people buy Switch because they want to play few games available for it now to complement their other system, why not? If anything buying a Switch due to its unique hybrid concept to complement other consoles/PC makes more sense than owning both of the redundant PS4 and XBox One. Finally, please, you don't need to tell us that FOUR years-old system that happened to lead the sales has more exclusive library than a new system barely few months old. That's like, super obvious. @SakuraHaruka Clear enough. I'm not trying to impose my opinion and i'm sorry if it's coming off that way. But I have indeed stated facts that some people just deny. A lot of Nintendo fans are very dedicated to the company, and they reject opinions without much thought. So if someone like me is going to make an intelligent point, I have to use facts that are hard to deny. But try as I might, some people still refuse to accept the facts. My opinion doesn't really matter. It's the facts that matter. And the fact is, many Nintendo fans, for whatever reason, feel a dedication to a company that listens to them far less than it should. @raisenv There was little doubt that the 3DS would do well once Nintendo ironed out the kinks. Of course however, at the early stages, it did resemble the Switch's current situation. That being said, you're right. The Switch is at far to early of a stage to make this kind of argument. However, i seriously doubt it will pick up. It may be successful in the end, but if Nintendo doesn't do something about the lack of decent games in the near future, handheld or not, I don't see much of a future for the console. However, my point still stands. it's getting ports of old games, and it's ports aren't up to par with it's home console competition. The only way these ports are worth anything on the console is the possibility to play them on the go. And honestly, I think that alone will be the console's selling point. There's no way a PS4 or PC can compete with that. Only question is, will people want it for that reason? Time will tell. As for the site being full of ravenous nintendo fanboys, maybe it's not full of them, but there are indeed loads of them here. And as for there being people on the site who own multiple systems, if they do, that's great. As a gamer, I'm glad to hear it. I myself want the Switch. But my time is full, and most of the games I want to play are on PS4 and PC. If I had the extra cash, spare time and there was more than just BotW waiting for me on the Switch, i'd jump on it. The article says Dynasty Warriors 8 Empires, but the video shows 7 Empires. Not a big deal, because there really wasn't much of a difference between the two. I can't wait for 7 Empires on Switch. I think this will be the first portable Empires game, actually. For those that haven't played them, the Empires spinoffs are much better than your typical Dynasty Warriors games. Gives me hope for a Gundam version. I'm a tragic fan boy I'd buy anything Gundam related. @Starbuster There's already a DW: Gundam series, but they're on PS2, X360, and PS3. Unfortunately, these are old enough that I don't expect a Switch port, especially since the most recent one (DW Gundam Reborn) didn't even get a physical release. Personally, I'd love to see an expanded version of WO3 on Switch that adds some Hyrule and Fire Emblem Warriors content. Sadly, this is just a direct port as far as I'm aware, so I'm not likely to buy it when I already have WO3U on PS4. @CheddarSword I think your points are very reasonable and well founded. Which is why I'm not buying the switch until Metroid prime 4 comes out. Nothing else on the system really interests me. There's also far to much to play on PS4 right now and in the future. You've listed some great examples of the games people are missing out on because of their ravenous loyalty to Nintendo. Which is sad. Nier: Automata, Horizon zero Dawn, persona 5, The last guardian aren't just good games. They're GREAT games that rival anything put out by Nintendo. A couple of them I would label as masterpieces of gaming. Then look at what's on the Horizon. TWO Edf games. EDF 5 and EDF Iron Rain. Dragon Ball Fighterz, Monster Hunter World, The remake (not remaster) of Shadow of the Colossus, Code Vein, NiNo Kuni 2, and so so much more. It's a great time for gaming. As long as you're not a loyalist. I mentioned this in another comment but this is what fans should come to expect. New exclusive titles that run well on the switch. If you're waiting for ports that run better on other systems then....why bother. Just get the other system that provides the superior experience. Here's an example of what Nintendo only gamers are experiencing : Capcom just announced the arcade edition of street fighter v for 39.99. Of course it's not coming to switch. Switch owners still get the privilege of paying 39.99 for ultra street fighter 2. A very old game. Stop rewarding this type of stuff Nintendo fans. "The outfits, though... it might be worth it for those alone." @DEADCELL No, it's DW Empires 8. It's just a naming thing. In japan, after the first dynasty warriors game, the series was renamed slightly. Then, they started adding numbers after that. So they're 1 number behind on the names over there is all. And it's all because the very first Dynasty Warriors game was actually a fighting game, not a hack n slash. @Thexare WO3 universe is technically done. Warriors All Stars does the same thing basically, except it doesn't have as many playable characters (30 in total), it's an all new story, and all of the demons are replaced with furries. On the up side, the gameplay improvements make it a decent experience. Watch Jim Sterling's review of the game. He sums everything up nicely. BTW, I happen to like furries, so that too is an upside for me. @FX102A Warriors Orochi is set in Tulsa. @CheddarSword probably goes on basketball forums to tell everyone that baseball is way better. @Thexare Yes, I played the heck out of DW Gundam 3 on the Xbox 360. And Reborn did get a physical release, at least here in Australia anyway. @bluesdance Actually, i hate all sports equally.